This is a hillside course built along valleys. Many holes border mountains, so you can enjoy dynamic play. Natural creeks often meander through the course and the strategic nature of the course will make you use every club in your bag. The layout is similar to the Leadbetter Course of the same Mission Hills GC. A straight par 4 with a creek along the left. The second shot is over the creek onto the elevated green. A long par 3. The green is protected by bunkers and trees on the right. A sharp dogleg to the right, downhill par 5. 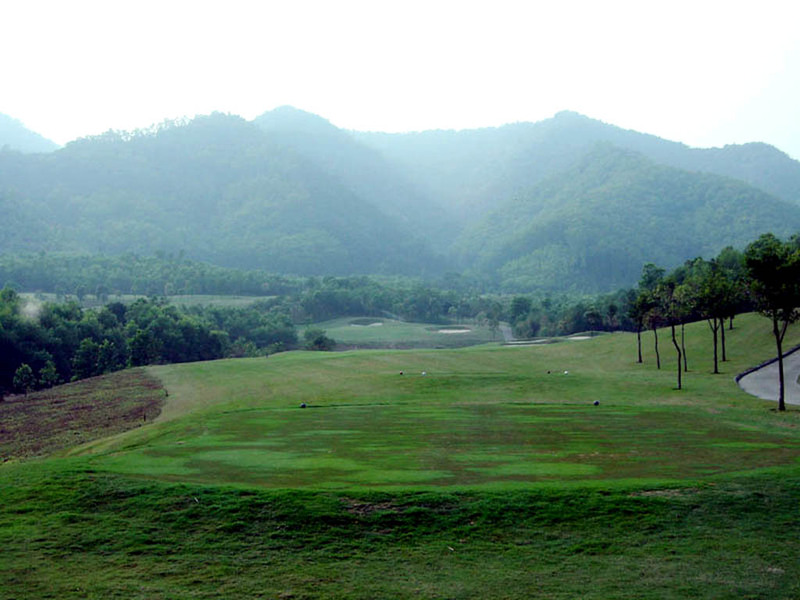 The tee shot should be accurate to avoid hitting into the mountain or trees. The second shot is a gentle downhill, so long hitters can reach the green in 2. The second shot area slope steeply to the right. A slightly uphill, short par 3 to hit toward to a mountain. A creek runs along the left side of the green, making right to left players more difficult. A dogleg to the right, relatively short par 4. It plays into a spectacular backdrop of towering mountains. The mountains on both sides come into play off the tee. Fairway as well as greenside bunkers are strategically placed. An almost straight par 5. The tee shot is downhill. The second shot is over a creek. 3 bunkers in front of the green are in play. Long hitters can reach the green in 2. The course is one of 5 that were completed in Dungguan in 2003 and 2004. A hotel is located next to the clubhouse. It takes 20 minutes from Mission Hills in Shenzhen by a shuttle bus. To play from the black tees, the longest tees, you need to show a starter a handicap certificate of 7 or below. Mission Hills GC is the world’s biggest golf complex with 10 courses or 180 holes as of 2004, overtaking the huge Pinehurst resort in North Carolina, which has eight 18-hole courses. The picture shows the 10 designers who are all world-famous players or a teaching pro. The 10 courses are designed by Jack Nicklaus, Vijay Singh, Nick Faldo, Jumbo Ozaki, Ernie Els, Annika Sorenstam, Rose & Poulter, Jose Maria Olazabal, David Leadbetter and Greg Norman. 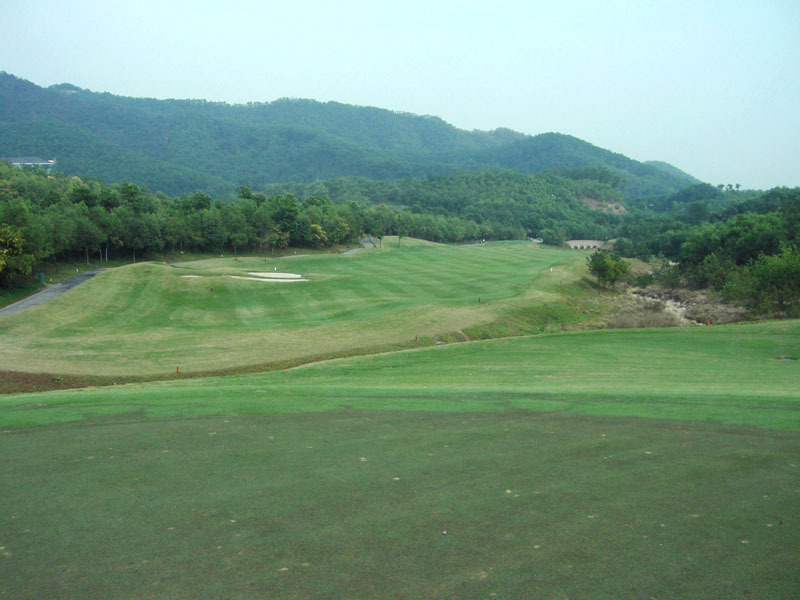 The two couses were added in 2007, Pete Dye Course and Zhang Lian Wei Couse (Par 3s course), so the club currently holds 12 curses or 216 holes.